The Pagani Zonda is a mid-engined sports car produced by Pagani in Italy. It debuted in 1999, and production ended in 2011. As of June 2009, 206 Zondas had been built, including test mules. Both 2-seat coupe and convertible versions have been produced. Construction is mainly of carbon fiber. Some of the early Zonda engineering was done by Formula One champion Juan Manuel Fangio. The car was originally to be named the "Fangio F1" after him but, following his death in 1995, it was renamed for an air current above Argentina. The Zonda C12 debuted at the 1999 Geneva Motor Show. It can reach a top speed of 208 mph (335 km/h). The Zonda S 7.3 of 2002 used a new, even larger V12 engine displacing 7.3 L (445 cu in) designed and manufactured by Mercedes-Benz AMG producing 547 hp (408 kW; 555 PS) and 553 ft·lbf (750 N·m), to better handle the power, traction control and ABS were made standard. In 2003 Pagani presented the Zonda Roadster, a roadster version of the Zonda S 7.3 with production limited to 40 examples, carrying the same components as the coupe, Pagani promised no loss of performance, a claim supported by the minimal weight gain of just 30 kg. First appeared at Geneva at a Auto Show in 2005, the all carbon fiber super car can reach 60 mph (100 km/h) in just 3.5 seconds. With power of 443 kW/594 hp, and a top speed that passes 215 mph (346 km/h), Zonda F makes Pagani manufacturer to be at the level of another independent of famous super cars manufactures like Porsche, Lamborghini or Ferrari. A car made by combining the sensibility of Juan Manuel Fangio, a F1 world champion 5 time in a row, about all that is related with technicality and the advance technology of Pagani, has a lot to offer, from the power to weight ratio of 384 W/kg, the six-speed manual transmission, the aerodynamic vents all around, not at least the carbon/ceramic brakes that allows the Zonda F to be on the top list of the cars with spectacular braking from 180 mph to 0 mph. The V12 engine is a lot cooler because of the design of the car, larger in front, 7.3 liter Mercedes-Benz engine can reach now 620 bhp and gives almost 561 pound-feet of torque peaking at 4000 rpm. It has a length of 174.6 inch, a width of 80.9 inch and a height just about 44.9 inch. The Zonda Roadster F debuted at the 2006 Geneva show. The final Zonda in its current form is a combination of the Zonda F and Zonda R to create a road-going track-day car. It has a top speed of 217 mph (349 km/h). The three Tricolore's will be priced at 1.2 Million pounds. It's also 6 mph (9.7 km/h) faster than a standard Zonda at 220 mph (350 km/h). 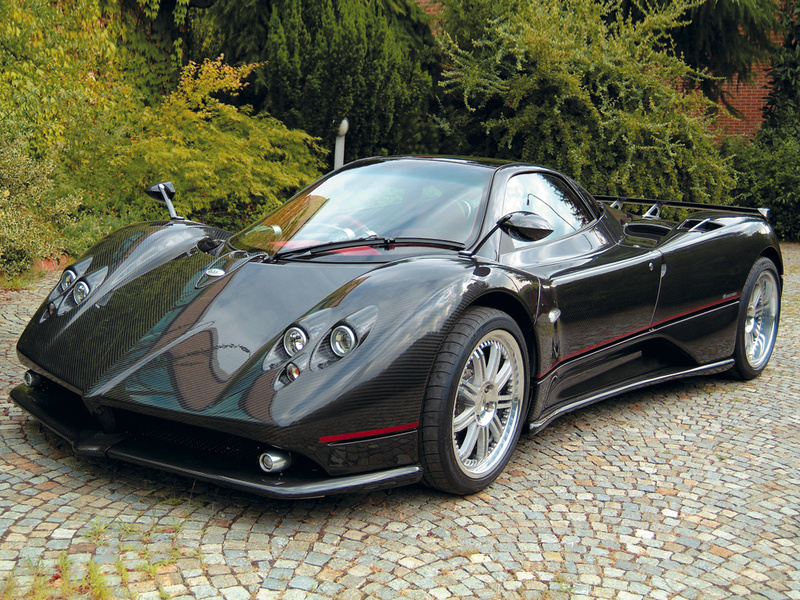 The Zonda C12 S Monza debuted at the 2004 Paris Motor Show as a track-day version of the Zonda for private use. The Zonda R debuted at the Geneva Motor Show 2007, using the 6.0 litre V12 engine sourced from the race version of the Mercedes-Benz CLK-GTR. Development of the Zonda GR started in December 2002.